Modern-day footballers only care about money and not the game, says former France midfielder Emmanuel Petit. 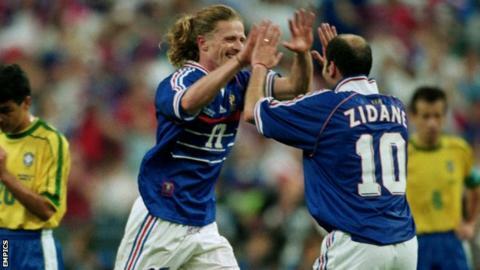 The 45-year-old won the 1998 World Cup and Euro 2000 with France and played for Arsenal and Chelsea. Petit told the BBC World Football Show: "Back in the days before earning a lot of money you had to prove your value year after year. You had to win titles. "This is the big difference with nowadays. Footballers nowadays are just focused on what they are earning." He added: "There will always be people who don't care about the club, result, if they win a trophy or if the fans are happy." The Frenchman started his career at Monaco and won the Premier League with Arsenal in 1997-98 before spells with Barcelona and Chelsea. "It's not just football. Society has changed a lot. I think humanity is in danger," he said. Asked why Chelsea, currently 15th in the table, had started the Premier League season so poorly, he said it was a mental problem, not a physical one. "They didn't lose their talent, their potential. It's in their mind, in their heart something has changed. In some way, they have lost their anger, they have lost their desire," Petit said. He says Chelsea's problems are typified by the plight of centre-half and skipper John Terry, who was an unused substitute in the 2-0 victory over Arsenal last Saturday. "John Terry was in the best XI of the Premier League last year, he was the captain of the champions," he added. "Then all of sudden everything changed in the space of a few weeks. That showed me that something has been broken during that time." Petit says he regrets leaving Arsenal for Barcelona in 2000 and also reveals he may have made another error by not swapping the Nou Camp for Manchester United. He claims former United boss Sir Alex Ferguson called him a couple of times when he was in Spain because he knew he was unhappy at Barca. "Maybe I should have gone to Manchester United and had a chance to play at Old Trafford with Roy Keane, Paul Scholes, Ryan Giggs, David Beckham and co. Another mistake from myself." Petit moved to Barca in 2000 on a four-year deal. Coach Lorenzo Serra Ferrer was fired before the season ended as Barcelona finished fourth in La Liga and the Frenchman joined Chelsea just 12 months after leaving Arsenal. "I arrived at a very bad time. There was a war in the dressing room between Dutch and Catalan players," he said. "And on top of it we had a manger who didn't have enough strength or charisma to manage the team. "Politics and nationalism was too much for me in the dressing room. I was so happy to join Barcelona but I just wanted to concentrate on football. Every day I was dealing with things I wasn't supposed to do. As soon as I arrived people said 'don't try to learn Castilian [Spanish], you have to speak Catalan'. "I said 'I'm in Spain, no?' and they said 'no, you're in Catalonia'. I'm fed up with that kind of thing. I understand their identity but when it's too much, it's very close to racism. We're talking about football - not religion or politics. I wanted to leave. I thought I made a big mistake."